The U.S. natural gas pipeline system is simultaneously one of America's most impressive and despised feats of engineering. The Energy Information Administration says there are about 3 million miles of mainline and other pipelines in the U.S. that connect producers to consumers. In 2017, the EIA says the network moved a whopping 25 trillion cubic feet of natural gas to 75 million customers. 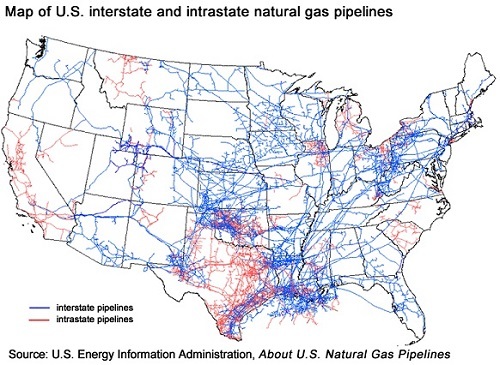 The American natural gas pipeline network is pretty remarkable. But it's also perhaps the most widely contested infrastructure system in the nation. Natural gas pipelines have been around for decades. According to the EIA, half of the existing natural gas pipeline network was installed in the 1950s and 1960s. 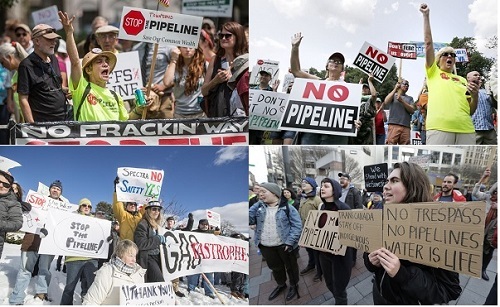 Most of these protesters grew up with natural gas pipelines. So why are people only recently starting to protest them with such fervor? Well, pipeline protests like those we see today have really been going on for decades. But there has been an increase in the number of these types of protests. And there's a simple reason for that: More pipelines are being built. Starting in 2000, demand for natural gas began to increase significantly — and prices followed. That incentivized producers to increase output and explore for new resources. Additionally, advancements in drilling and production techniques led to fracking, which also contributed to increasing natural gas output. So, in short, natural gas demand and prices were healthy, output was increasing, and producers needed a way to get their gas to consumers. The answer was to build more pipelines. More pipelines being built = more protests over them. The thing about these protests, though... they're rarely successful. It's an understatement to say natural gas has become a vital component of society. And it's becoming more and more important every day. You''ll also get our free report, "Natural Gas Outlook: 2019 and Beyond" by our resident expert Christian DeHaemer. 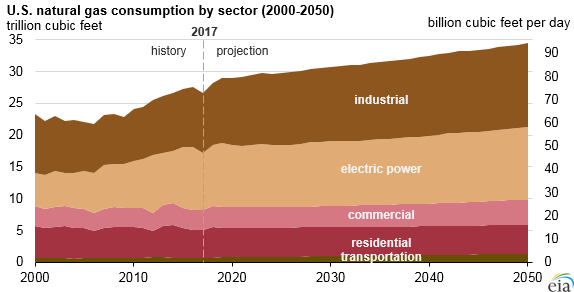 The EIA estimates U.S. natural gas demand to continue increasing for the next few decades. It projects a near 40% increase in demand between 2017 and 2050. Meanwhile, production is set to increase even more. The EIA forecasts that U.S. natural gas production will continue to increase nearly 60% over the same time. All this means more pipelines are going to be needed to transport all this fuel. It also means we'll probably continue to see more natural gas pipeline protests. And both of these things mean big gains for energy infrastructure investors. Obviously, the need for more pipelines will benefit energy infrastructure investors. But the protests might very likely end up benefiting them as well. See, as I mentioned just a minute ago, half of the existing natural gas pipeline network was installed in the 1950s and 1960s. They're old. And many need repair. The Infrastructure Report Card from the American Society of Civil Engineers gives U.S. energy infrastructure a grade of D+... just barely passing. These protests draw attention to the state of the pipeline system and, more importantly to energy infrastructure investors, the need to spend money to repair them. Congress is working on passing the +$200 billion infrastructure bill. And when it does, you can bet that building new and repairing existing natural gas pipelines will be at the top of the spending list. You can check out Keith's entire presentation on infrastructure bill spending and how it will essentially end up writing you checks right here. Energy and Capital editor Keith Kohl shows investors why a small group of stocks in the oil sector are proving to be a profit windfall for investors.